Goodreads review: The Castle of Otranto | Yeah nah. 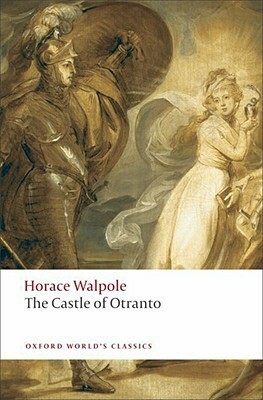 The Castle of Otranto by Horace Walpole. So it’s coming up to the holidays so I thought to myself what better time to check out the first English supernatural novel, progenitor of the Gothic genre and on-point guide to decorating your home with revenge-themed supernatural armour? And so I reached for Horace Walpole’s 1764 banger. Basically, everything you know about the Gothic mode – weird religious symbolism, perverse family intertwinings, twisted tunnels, ghosts kicking arse from beyond death, the horror of landscape and the terror of the built environment – is in here. The tale of Manfred (a shitbag noble), it begins with his son’s crushing wedding-day death (take that, Alanis) and grows ever more convoluted and wrong. Seriously, Manfred makes Roderick Usher seem well-reasoned, something that’s compounded by vengeful spirits and uppity religious figures. I don’t want to spoil the story, but it’s as ridiculous and strangely acceptable as you’d expect the initial text for an entire style of writing might be. Of course, the book can be difficult to read if you’re not adjusted (or in the mood for) its fairly tortuous, multi-clausal sentences. Homeboy Horace doesn’t believe in paragraph marks very often, and so though the work is pretty short, there’s lots of stretches where there appears to be no pause to the proceedings. This is great in terms of ratcheting up the tension, but not so hot in terms of reader fatigue. I’ve studied a lot of literature of this period, so I don’t find the difference in tone and structure insurmountable, but it soon became obvious my 1700s-scopin’ muscles weren’t as developed as they once were: I found myself rereading sections for clarity. I’d read Otranto before but couldn’t remember much of it. I’m glad I had a chance to revisit, because a lot of it is so weird, even when compared to Anne Radcliffe’s work. I prefer Radcliffe on the whole, but the imagery of horror – enormous battle-armour, the hidden made real – fits so tightly with the odd-scale weirdness I see in my nightmares that it affected me more than I thought it would. There’s a distinct oddity about this book – it doesn’t know what it wants to be, exactly – that drew me back. It’s so ridiculously improbable – I think the helm’s furious nodding feathers are my favourite part – but it touches some primal part that I let all unsupportable parts of the tale slide. While it’s not as much of a cracker as The Mysteries of Udolpho, and lacks the masterful touch of a Frankenstein, the atmosphere Walpole creates here is memorable. It’s obvious that other writers built upon this base, but it’s worth remembering this seedbed of oddity on its own terms, flaws and all.